I was out with Paul Barr (he of the dubious camera-stabilization technique 🙂 ) and came across a sight that he suggested would make a good “What am I?” Quiz, and I readily agreed. Continued here... (though, here's a direct link to the answer). I think these are old cut-off wheels. Looking at your last posts about stones of old temple in the border of the road. Have you some news about this old forgotten temple ? They are “tile” circular saw blades. 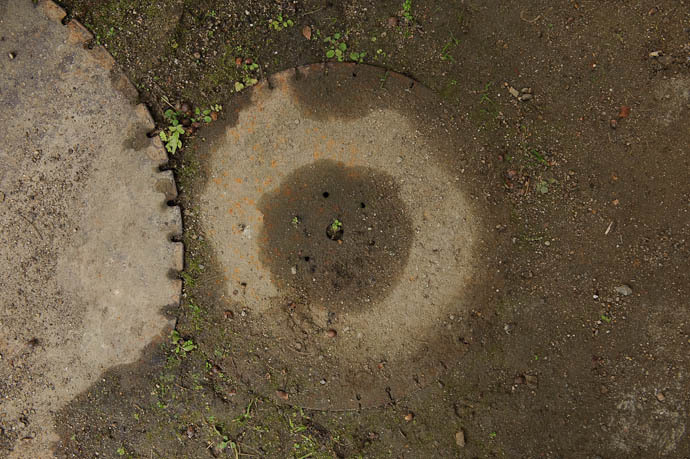 two concrete saw blades rusting on the ground. I have no idea what that is. However, I was thinking to myself just this morning that it’s been a long time since the last “What am I?” post. Looks like it’s a good one! Saw blades, diamond usually, for cutting stone. Hi Jeffrey, I’m following you now for about a month. (through your blogs ofcourse). I must say I’m impressed!! You’re making wonderfull photo’s. And I must say I learned a lot from you. But regarding the What Am I picture: I think ist a blade for a sawing machine. Best reagrds and keep going with the good work! It is an old stone (granite) saw. My first guess is a saw blade. The inside of an Amstrad P:C:!! looks like an old circular sawblade. Well, it was worth a try, but especially considering the context, I guess it was too easy. (Yes, they’re circular sawblades used for cutting stone.) I’ll try harder next time.